Jorge Cadete’s transfer to Celtic was one of the most controversial in Scottish football history. Cadete was a striker of some renown who was in dispute with Sporting Lisbon and was said to have bought his contract out after being in dispute with the Lisbon club. He was technically a free agent but it was still a great surprise when the bold Jorge turned up at Celtic Park in March 1996 to discuss a transfer to the Celts. The surprise was a hugely pleasant one to the Celtic supporters and it was a further sign of Celtic’s intent and ambition under the management of Tommy Burns and Fergus McCann. Jorge had built himself a considerable reputation with Sporting and the Portuguese national side. In the 1993 UEFA cup he had put Celtic to the sword in Lisbon by scoring two goals to enable Sporting to go through on a 2-1 aggregate score. Also in 1993 he had been the main instigator when Portugal had beaten Scotland 5-0 in Lisbon in a World Cup qualifying game which brought Andy Roxburgh’s reign as Scotland manager to an abrupt ending. Disappointment then came Celtic’s way when Cadete was prevented from playing for a short period due to red tape with the football authorities. This affair would take too long to explain in great detail but suffice to say a few years later the SFA disposed of the services of their chief executive after he was found guilty of irregularities during Cadete’s transfer at an independent commission. Celtic were wounded by the delay in the transfer as they had drawn several games during his absence which they felt they may have won had Cadete’s considerable talents been available to them. By the time Celtic played Aberdeen on 1st April, they had fallen behind Rangers in the title race and were very keen to gain victory over the Dons. STV showed this match live on a Monday evening and a capacity crowd of 35,000 turned out to watch. Parkhead was undergoing a period of reconstruction and only the main stand and north stand were in operation with the skeleton of the Lisbon Lions stand now taking shape on the periphery. Celtic’s recent record against Aberdeen had not been terrific but there was a great sense of anticipation in the crowd when Cadete was named as a Celtic substitute. Only two minutes were gone when Simon Donnelly scored with a flashing header from a Tosh McKinlay cross. McKinlay was to enjoy perhaps his best game in a Celtic jersey and Pierre Van Hooydonk made it 2-0 at half time after the Celtic full back had again supplied the opportunity. Celtic’s third goal was the best of the night when McKinlay’s dazzling run into the area allowed Simon Donnelly to thrash a shot past Michael Watt in the Aberdeen goal. The Dons were now visibly crumbling under intense Celtic pressure and Van Hooydonk scored the fourth from a McKinlay corner. 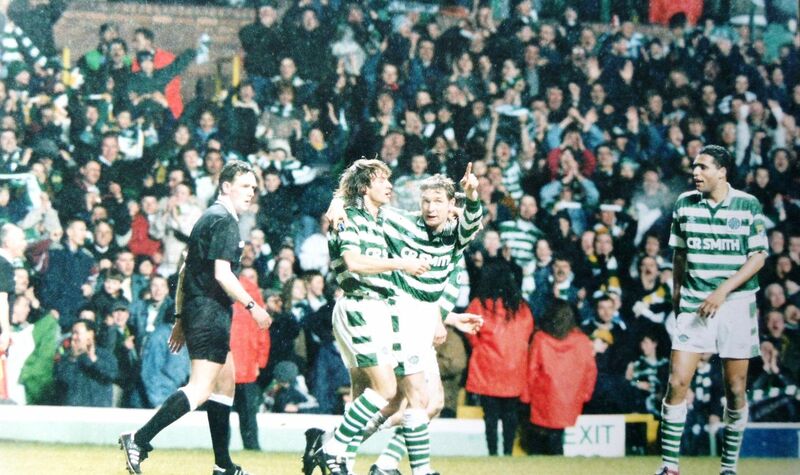 In 75 minutes Celtic Park erupted when Jorge Cadete made his long awaited debut by replacing Andreas Thom. He was only on the field two minutes when he showed great awareness to race on to a Peter Grant through ball to lift the ball over Michael Watt and into the net. Celtic Park exploded with a crescendo of noise, so much so that the roars blew out Radio 5’s microphones, who had been covering the game UK wide on radio and they went off air for a short time until it was repaired. One wag after the match commented that Cadete had done with one stroke what the Luftwaffe couldn’t do during the war and put the BBC out of service ! On the night Aberdeen had been shown to be ‘April fools’ as Celtic destroyed them in the cold, spring rain and the Parkhead fans loudly roared out Jorge Cadete’s name in approval of his short cameo appearance. Booked For Scoring At An Away Ground?